David Merriman, deputy manager for Roskill Information Services’ minor metals division, discusses factors currently impacting the rare earths market. Spot prices for neodymium and praseodymium, two of the 17 rare earths, have risen by 50 percent in China year-to-date, according to an August report from research and advisory firm Adamas Intelligence. 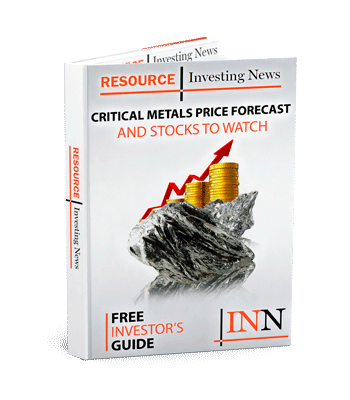 In an August 16 interview with the Investing News Network, David Merriman, deputy manager for Roskill Information Services’ minor metals division, said neodymium oxide was trading at $68 per kilogram, while praseodymium oxide was going for $85 per kilogram. Merriman said that’s a $10 increase from the beginning of the month. “Similarly, lanthanum, cerium and dysprosium have all been showing quite positive trends recently. So yes, the whole suite of rare earths really seems to be increasing in price,” he said. Neodymium, praseodymium, lanthanum and cerium are light rare earths, while dysprosium is a heavy rare earth. Other factors driving prices up include traders in China purchasing material and “creating a bit of false demand there. There’s been suppliers that have been slightly holding back supply, which has decreased the material availability on the spot market in particular. That, combined with environmental inspections, has limited production at some operations,” he added. Overall, demand is currently highest for light rare earths, which tend to be lower in value than heavy rare earths. Merriman said prices for lanthanum and cerium, the rare earths that comprise the bulk of production, are “increasing quite significantly,” but the movement has not been as extreme as the jump in neodymium and praseodymium prices. Lanthanum and cerium are used in fluid catalytic cracking, emissions catalysts, glass polishing powders, NiMH batteries and additives for glass production. “We do expect to see demand for these materials to increase. Particularly on the autocatalyst side as more stringent emissions controls are input. These require more catalytic material being used and catalytic equipment to take out the emissions,” he noted. In contrast, growth for heavy rare earths terbium and europium, used in phosphor powders, has slowed by two-thirds since 2011 in the move to LED lamps. China remains the world’s main producer of rare earths by a wide margin, and rising prices have boosted business for rare earths producers in the country. The share price of major miner China Northern Rare Earth Group (SHA:600111) is up 52 percent so far this year, and in July the company forecast a 260-percent increase in its first-half profits compared to the previous year. However, concern over China’s monopoly on the rare earth supply chain continues to grow. Merriman noted that the US and Japan are looking to increase domestic rare earth magnet production and downstream processing manufacturing. Adamas Intelligence notes that Lynas (ASX:LYC) is “well positioned capitalize on higher [neodymium-praseodymium] oxide prices and reduced spot supplies in the near term.” Lynas produces about 5,400 tonnes of neodymium-praseodymium oxide per year, and has a long-term supply agreement with Sojitz (TSE:2768) in Japan. Africa: Peak Resources (ASX:PEK), Mkango Resources (TSXV:MKA), Rainbow Rare Earths (LSE:RBW). Canada: Commerce Resources (TSXV:CCE), Matamec Exploration (TSXV:MAT), Search Minerals (TSXV:SMY). Greenland: Greenland Minerals & Energy (ASX:GGG). Australia: Alkane Resources (ASX:ALK) , Arafura Resources (ASX:ARU) , Northern Minerals (ASX:NTU).